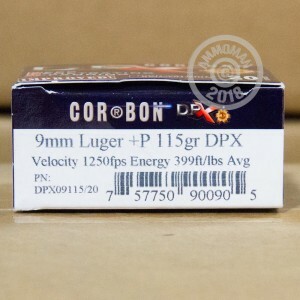 This high pressure 9mm Luger ammunition from Corbon's DPX series is a great choice for self-defense if you carry a larger pistol capable of handling +P rounds. 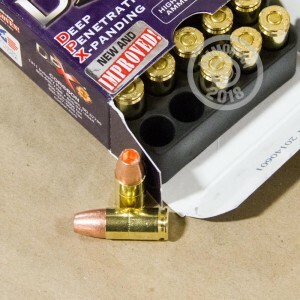 Each cartridge in this box of 20 fires a light 115 grain solid copper hollow point bullet at a muzzle velocity of 1,250 feet per second. Corbon ammunition is typically loaded "hot" to produce better penetration and expansion. It is loaded in Sturgis, South Dakota using non-corrosive Boxer primers and brass cases. AmmoMan.com is the place to be for all your ammunition needs. It's easy to keep your costs under control with free shipping for all orders over $99!